South Korea and the Democratic People's Republic of Korea (DPRK) on Tuesday started high-level talks, the first in about two years, at the truce village of Panmunjom, with an initial focus on the DPRK participation in the South Korea-hosted Winter Olympics. The plenary session kicked off at around 10 a.m. local time (0100 GMT) at the Peace House, a building in the South Korean side of Panmunjom straddling the heavily guarded inter-Korean land border. This is the first inter-Korean meeting since the new South Korean government under President Moon Jae-in was inaugurated last May. The last was held in December 2015 between vice ministerial-level officials from the two sides. The five-member South Korean delegation was headed by Unification Minister Cho Myoung-gyon, while the five DPRK delegates were led by Ri Son Gwon, chairman of the Committee for the Peaceful Reunification of the Fatherland. Ri said in his introductory remarks that he hoped to give the first New Year's gift to the people on the Korean Peninsula, which could be the "precious outcome" of the talks, by dealing well with this meeting in a sincere manner. In response, Cho said the PyeongChang Winter Olympic and Paralympic Games was anticipated to become a peace festival as there would be a delegation, or "precious visitors," from the DPRK. Cho said the inter-Korean dialogue was resumed after a long hiatus, calling on the DPRK to continue talks with a firm will and patience. The plenary session has lasted for over one hour, and the meeting between chief delegates started at 11:30 a.m. (0230 GMT) at the same venue, according to Seoul's unification ministry. The two sides are expected to initially focus on the DPRK participation in the South Korea-hosted Winter Olympics, which will open on Feb. 9 in South Korea's eastern county of PyeongChang. Signs of a thaw in inter-Korean relations emerged as top DPRK leader Kim Jong Un said in his New Year message that Pyongyang was willing to participate in the 2018 Winter Olympics and talk with Seoul about it. On the following day, Seoul proposed to hold high-level inter-governmental talks. Pyongyang accepted the dialogue overture without making any change of the timing and venue South Korea suggested. 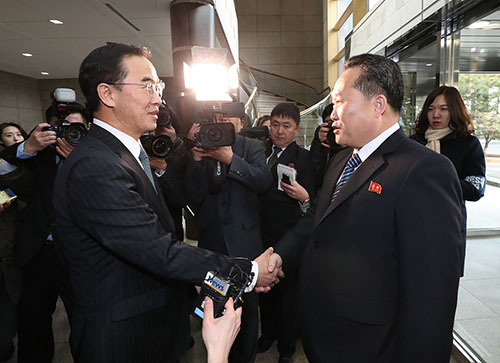 Before leaving for the dialogue venue, the South Korean chief delegate told reporters that he will face the meeting 'calmly and not hurriedly" to make the 2018 Winter Olympics a peace festival and take a first step towards improving inter-Korean relations. The South Korean delegation arrived at the Peace House, the dialogue venue in Panmunjom at 8:46 a.m. The DPRK delegation arrived at a place near the Peace House at around 9:30 a.m.(0030 GMT), crossing the military demarcation line (MDL) on foot to the dialogue venue. If the dialogue goes smoothly, the two sides were forecast to issue a joint statement later in the day. Apart from the DPRK participation in the Winter Olympics, other issues could be later put on the agenda of the talks. Seoul already offered to Pyongyang a list of issues of mutual concern to be discussed, including the reunion of separated families and the military affairs to ease tensions on the Korean Peninsula. The reunion of families across the MDL is an emotionally-charging issue often reflecting political situations. People from South Korea and the DPRK have been banned from visiting and contacting each other since the 1950-53 Korean War ended in armistice instead of a peace treaty. The Korean Peninsula remains technically in a state of war.